was suffering accountancy fraud at the highest levels, claiming their profits for the half-year would be £263 million higher than they actually were. 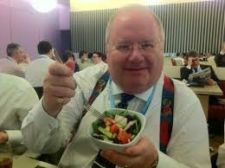 Now, amid billions wiped off shares, corrupt directors forced to resign and investigations by law firm Freshfields which reveal more illegality by the day, the multinational faces its most terrifying prospect yet – an intervention from Eric Pickles. man’s bosses in government, this latest ‘pet project’ appears to be a case of Eric going rogue. Diddyman – all my pals in the legal trade have wangled this so I’m gonna sort everything out – there’s loads to be assessed at Tesco, particularly in the bakery department. Indeed, Pickles’ efforts were greeted with delight by shareholders, the stock market and boroughs across the country who were hoping he would have less time for his regular job now and leave them the hell alone. But within Tesco itself management types such as Head of IT Allan Antevasia speak for a workforce disturbed by this pattern of official interference. suggestible and slight” Foreign Secretary, Phil Hammond.